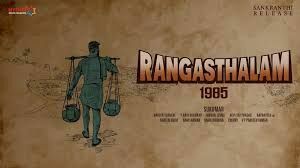 Please note Rangasthalam 1985 (Telugu) Movie occurred in past. Rangasthalam is an Indian Telugu period drama directed by Sukumar and starring Ram Charan and Samantha Akkineni in the lead roles, while Aadhi Pinisetty and Jagapathi Babu play crucial roles. The music is composed by Devi Sri Prasad.